[Jesus said,] "In fact, you sent investigators to listen to John the [Baptizer], and his testimony about me was true. Of course, I have no need of human witnesses, but I say these things so you might be saved." John the Baptizer told the truth. John died telling the truth. John gave his life to prepare the way for the truth. We could search through all of history and not find a more credible and authentic witness to integrity and truth than John the Baptizer. John helped thousands find their way to salvation in Jesus. 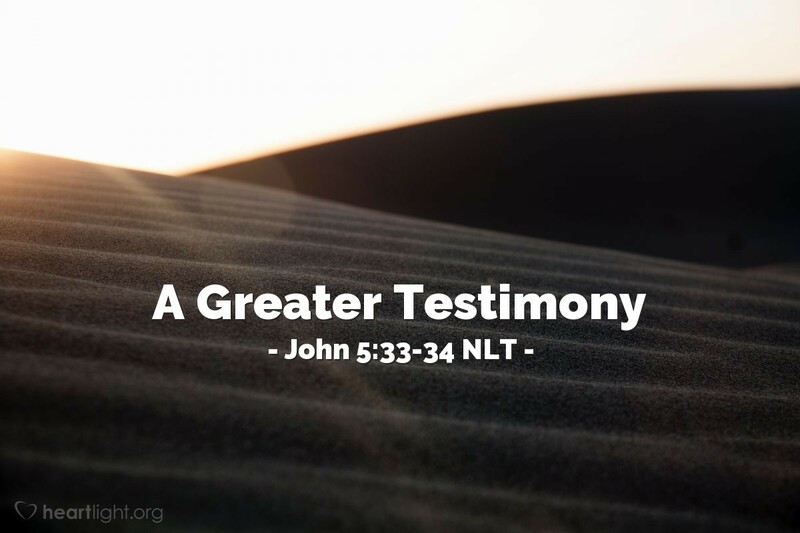 However, as great a witness as John was, Jesus had a greater witness. God himself chose to offer "testimony" about Jesus. He validated Jesus through the miracles he performed and the resurrection that showed him to be God's powerful Son. How has God helped validate the truth about Jesus to you? How has this "Greater Witness" helped you to see Jesus as your Lord? Father, thank you for your word spoken through the prophets and shared with your people through the Scriptures across the centuries. Thank you for confirming Jesus' identity through his miracles and his resurrection. Thank you for showing your resurrection power in Jesus through the church. Help me find ways to help my lost friends find your testimony to Jesus and come to him and be saved. I pray in your Son's name, Jesus my Lord. Amen.